The risk assessment of a super-large dam exposed to multiple natural risk sources is arduous because of uncertainties in the complex environmental system. 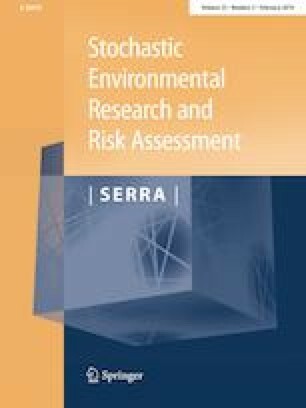 Few risk assessment studies consider all of the following factors: the cascade dam effects, the major natural hazard sources and the probabilistic relations between the influencing factors. In this study, we present a Bayesian model of risk analysis (BMRA) for dam overtopping under the combined effects of flood and earthquake. The BMRA involves (1) constructing the specific Bayesian network structure, (2) determining the prior probabilities of parent nodes by hydro-statistical and special probabilistic analysis methods, (3) establishing the parent–child causal relationships by a semi-empirical semi-theoretical method and the relevant statistical analyses results for American dams, (4) creating the conditional probability table by the noisy-OR model, and evaluating the dam-specific overtopping risk probability. The model is applied to analyze the overtopping risk of the Shuangjiangkou (SJK) dam (in the Dadu River Basin, Southwestern China) under flood and seismic impacts. The results reveal that the SJK dam has a very low annual dam overtopping probability over its life cycle and satisfies the corresponding risk control standard. Compared with conventional approaches, the BMRA within the logical context of Bayesian theory addresses uncertainties in risk analysis and provides an advanced, updatable means to assess the dam risk affected by the combined effects of flood and seismic hazards. Thus, the BMRA approach enables an improved, better-informed and more reliable estimate of dam risk. This work was supported by the National Natural Science Foundation of China (Grant No. 41501554), the Programme of Introducing Talents of Discipline to Universities (BC2018038), and National Basic Research Program of China (Grant No. 2013CB036401).